Ilczuk, Wasyl [Василь Ільчук] – teacher, priest of the Ukrainian Autocephalous Orthodox Church (UAOC) in the Diaspora; born on 1 January 1895 in the village of Mlynivtsi (Kremenets raion, Ternopil oblast, Ukraine; at that time – Kremenets county, Volyn gubernia, Russian Empire); died on 9 July 1951 in London, England, United Kingdom; buried in Gunnersbury Cemetery, London. After graduating from a teachers’ seminary and a teacher training college, he worked as a teacher in Volhynia. In addition to his teaching he was involved in directing parish church choirs. Later he became an inspector of schools. In the early years after the Second World War he lived in Germany where, in 1947, he was ordained as a priest of the UAOC. For a time he was responsible for the pastoral care of UAOC members in the displaced persons camp at Seedorf near Hamburg. In May 1950 he moved to England. Initially he was rector of the Midlands parish district of the UAOC in Great Britain. In August he was appointed to the financial oversight committee of the interim General Board of the UAOC in GB. 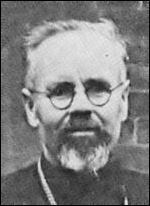 In November 1950 he was appointed head of the interim General Board and also rector of the London parish of the UAOC. In January 1951, at the Second Convocation of the UAOC in GB, he was elected head of the General Board.